Since the beginning of this project created by Delilah “Zena” Salgado-Mata in 2011 it has been an honor to learn professionally and grow spiritually with my life-long friend on this journey of our creative life. This is the collection of photographs and digital marketing efforts that contribute to this beautiful display of Chicago Artistic work. It’s been an honor to show work among these seasoned professional artists and welcome aspiring artist to the Chicago creative community. Photography by Hector Gonzalez, Cienfuegos Photography. Coffins are hand crafted every year by Master Woodsmith, Tim Dashnaw. 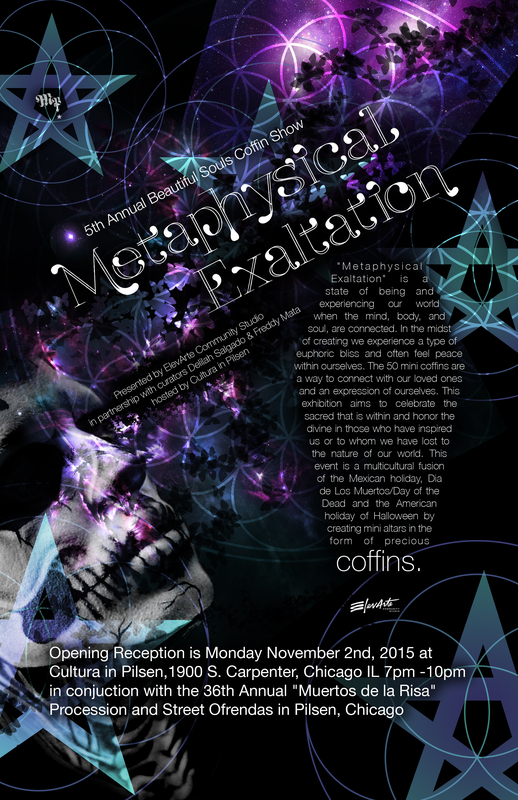 The 2016, 6th Annual Beautiful Souls Coffin Show was hosted by 4Art Space in the Zhou B Art Center, organized by Surreal Rabbit’s Alejandra & Akira. 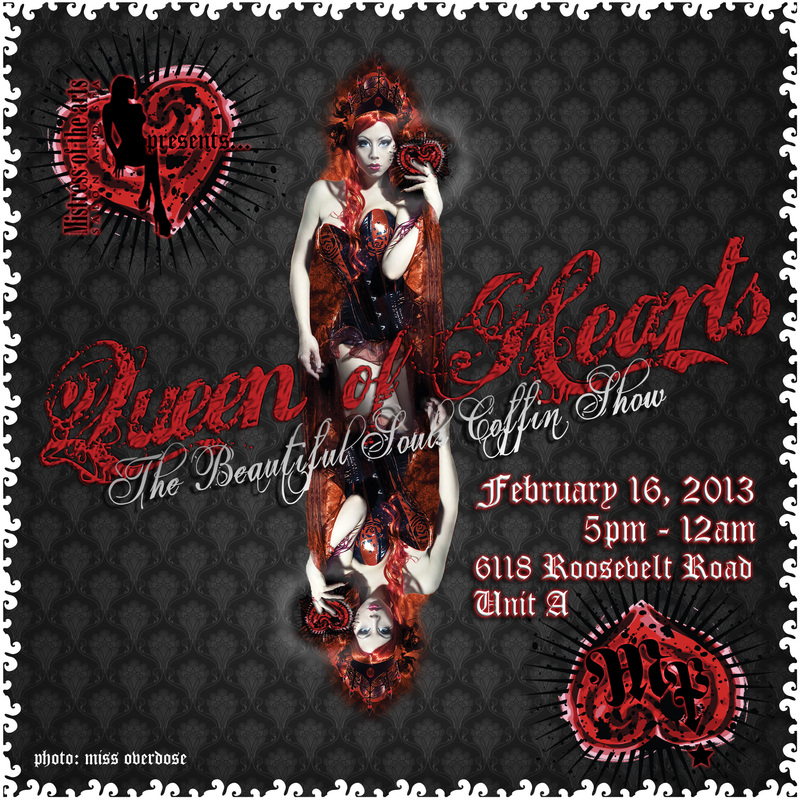 2016 Flyer Design by Adriana Peña. “Metaphysical Exaltation” is a state of being and experiencing our world when the mind, body, and soul, are connected. In the midst of creating we experience a type of euphoric bliss and often feel peace within ourselves. The 50 mini coffins are a way to connect with our loved ones and an expression of ourselves. This exhibition aims to celebrate the sacred that is within and honor the divine in those who have inspired us or to whom we have lost to the nature of our world. This event is a multicultural fusion of the Mexican holiday, Dia de Los Muertos/Day of the Dead and the American holiday of Halloween by creating mini altars in the form of precious coffins. Opening Reception took place, November 2nd, 2015 at “Cultura in Pilsen” 1900 South Carpenter in conjunction with the 36th Annual “Muertos de la Risa” Procession and Street Ofrendas in Pilsen. Music provided by: Raya Line. 12″x18″ Coffins are hand crafted by Master Woodsmith, Tim Dashnaw. Curator Delilah Salgado & Cultura en Pilsen. “Cultura Cura” is a journey and exploration of the self, our culture and the connection we feel to people we have loved, lost or admired. Culture being a living and evolving concept, this exhibition aims to nourish and heal our spirit by creating a space where artists can fuse both the Mexican Dia de Muertos/Day of the Dead and the American holiday of Halloween by creating mini altars in the form of precious coffins. 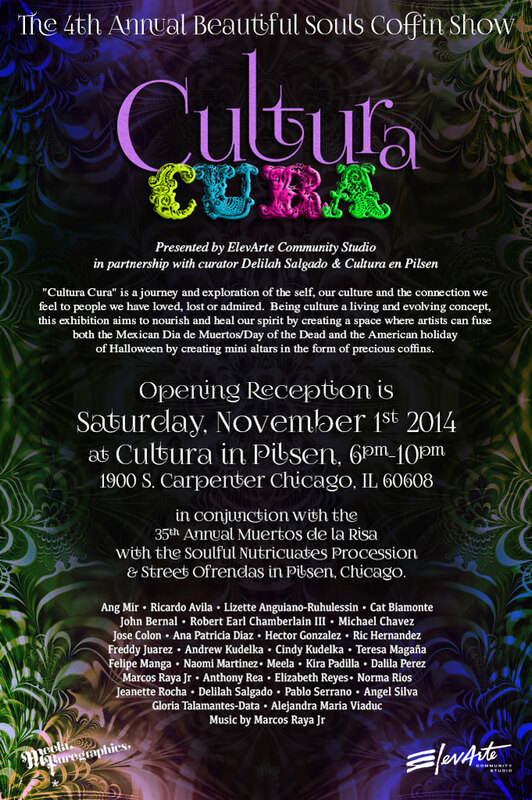 Opening Reception was Saturday, November 1st, 2014 at Cultura in Pilsen, 7pm-10pm, 1900 S. Carpenter, Chicago, IL 60608 in conjunction with the 35th Annual Muertos de la Risa with the Soulful Nutricuates Procession & Street Ofrendas in Pilsen, Chicago.